Last year I pratfell in love with Doc Feldman and the LD50. As it turns out, one of my favorite songs from the album was actually written by a (younger?) and more hopeful group of humans. Doc made "Battle Hymn" sound like a dirge. In the hands of the Brothers Lazaroff, the song is an act of hopeful defiance. Each reading has its place, but the song is a knockout no matter who or how it's sung, and the rest of Hope, Fear, Youth is even better. The band is (unsurprisingly) fronted by Jeff and David Lazaroff. But they did something smart. They didn't team up with some dudes and make an Americana band. They teamed up with some dudes and made an American band. 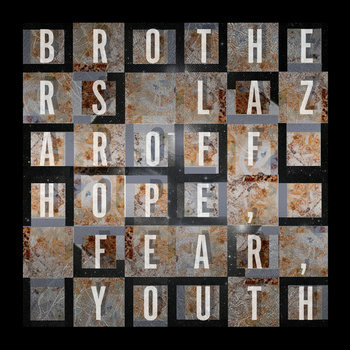 The Brothers Lazaroff weave jazz, country, and soul into their rock. The result is a sophisticated gumbo that reminds me of Cowboy Mouth in its heyday and Paul Sanchez now: rock'n'roll with an emphasis on the "roll" -- a paean* to what makes our folk music so damn good. *it took me way too long to find the proper spelling for that. Damn Greeks.